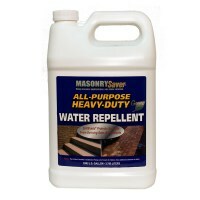 Masonry Saver (Defy) All Purpose Heavy Duty Water Repellent is the "Work-Horse" product of the Defy line. This proprietary blend of silanes and siloxanes creates a "SaltShield" barrier on concrete surfaces, for greater resistances to the deteriorating effects of road salts and de-icing chemicals. This superior concrete waterproofing product is a great choice for both horizontal and vertical above grade surfaces including driveways, sidewalks, adobe, architectural concrete, clay brick, mortars, natural stone, limestone, sandstone, granite, terra cotta, exposed aggregate products, Portland cement stuccos, and concrete masonry units. Breathable, non-film forming and will not alter the surface color or appearance. 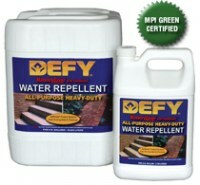 Coverage Rate: Apply with pump or airless sprayer. This superior concrete waterproofing product is a great choice for both horizontal and vertical concrete.
. What product would you suggest. also, what would use to clean and prepare the floor before installing the Sealer and water proofer. A low luster shine would be preferred. This product is excellent. After recent heavy storms, my driveway and sidewalks showed no water retention at all. Very Dry. Glad I used it. I want to apply to my driveway, garage, and front steps. Will it change the look of the concrete? And will it make it slippery? Mary Ellen, no it should not.